With New York City as its epicenter, thousands of contemporary, experimental, and fine art galleries extend all over New York State. 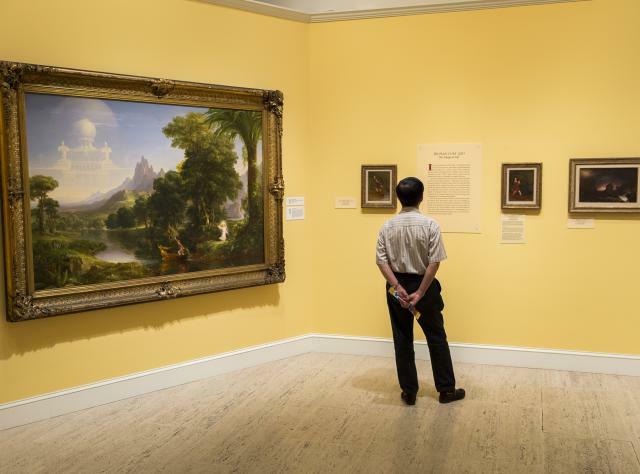 As you travel, you’ll see the spectacular scenery that inspired the Hudson River School of Art movement, and captivating artworks by both established and emerging artists who live in New York and around the globe. From storefront studios that enliven village streets and country back roads to posh uptown galleries and museum exhibitions in New York’s largest cities, you’ll find arts and crafts galleries, photography centers, fine art dealers, solo artist shows and edgy exhibits in experimental spaces. Visit New York City galleries including Gagosian, Barbara Gladstone, The Museum of Modern Art and Guggenheim Museum, which all continue to set high artistic standards, and exhibition spaces. All five boroughs have followed their trailblazing paths – and created new art-loving audiences along the way. There are NYC fine art galleries in Chelsea and Soho; in the Lower East Side, The Meatpacking District, and in Brooklyn&apos;s Williamsburg and DUMBO neighborhoods. Elisa Contemporary Art, in Riverdale and privately curated shows, focuses on the transformative power of the arts. Lehman College Art Gallery’s “Public Art in the Bronx” features walking tours to view a rich collection of works, and upstate, First Friday Art Walk in Binghamton and Kingston First Saturdays are two cities hosting monthly gallery-hopping openings. In Adirondack towns like Jay, Keene, and Wilmington, you’ll find regional art and craft galleries. TAUNY’s North Country Folkstore showcases the works of more than 100 regional artists, and the 14 members of the Adirondack Artists’ Guild operate a cooperative retail gallery. The Courthouse Gallery in Lake George features experimental works, as does davistudio, in Chatham, which emphasizes porcelain art. In Buffalo, Big Orbit Gallery & Soundlab showcases regional avant-garde visual, sound and new media artists, and CEPA Gallery brings contemporary photo-related artworks of western New York artists into sharp focus. Memorial Art Gallery at the University of Rochester, the best-balanced permanent collection outside of NYC, captures 5,000+ years of art history with 12,000+ objects. Nearby, Center at High Falls Fine Art Gallery and Museum overlooks a 96-foot waterfall, and down in Westfield, Portage Hill Gallery holds many hidden treasures in a 1830s Greek Revival home. New York State definitely has art gallery tours to suit any artistic taste – and they’re all over the map!